Some of my tried and true recipes I’ve perfected over the last decade or so. I plan to add more as my continued experimentation in the kitchen pays off. With the advent of pinterest I’ve been posting a lot fewer recipes here and just trolling there for new menu ideas. I do have a simple favorite that I’ve been making again and again. Modified from this recipe. I’ve cut out the things I don’t really care for and added a few that I do. Combine cooled quinoa with orange segments, avocado, beans, corn, lima beans, (optional cilantro), salt and pepper. Pour Lemon Vinaigrette over the salad and stir to combine. Serve cold or at room temperature. Eat as is or top with the protein of your choice. Enjoy! My son didn’t like these scones because they weren’t as sweet as he expected. They’re far more subtle and earthy. 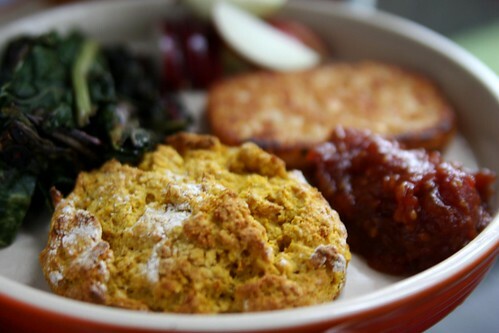 Perfect for Fall breakfasts, or as a replacement for dinner rolls or biscuits. 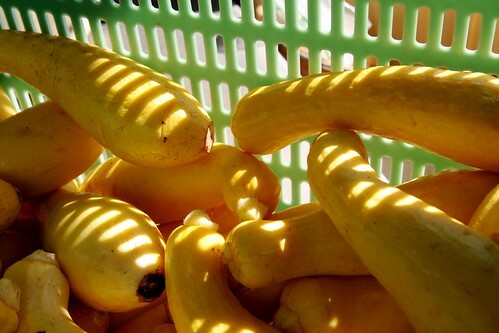 Make sure squash is drained well, let sit on paper towel to absorb any moisture. Sift flour, baking powder, and cinnamon into a large bowl. Add in margarine and mix with fork or pastry blender. Stir in sugar, squash and minced ginger. 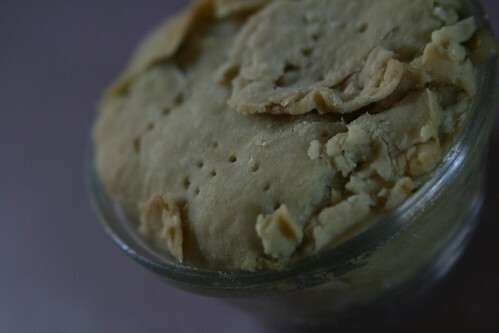 Stir in soy milk, 1 tablespoon at a time until you have soft dough. Combine all ingredients gently. Turn dough out onto floured surface. Press dough down until it’s flattened out to about 1″ thick, using hands. Using a knife or 2″ diameter glass, cut out scones in triangles or circles. Place on parchment paper or silpat on baking sheet. 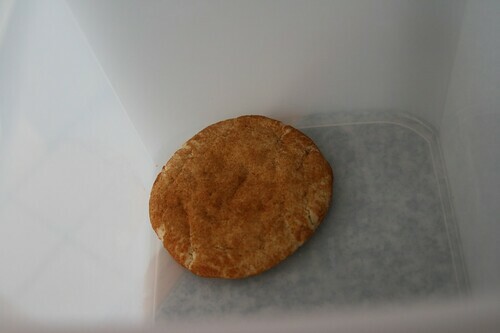 Bake for 10-15 minutes or until well risen and golden brown. 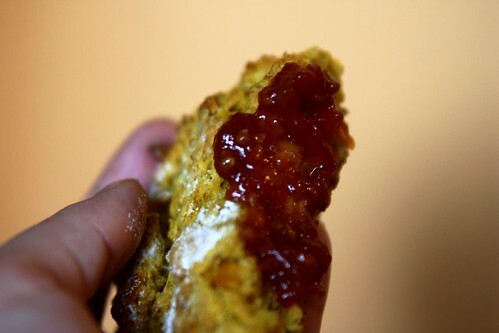 I used this jam on the squash scones I made - delicious! - and in place of ketchup on my hash browns. Super tasty. Drop the tomatoes in boiling water and boil for 2 to 3 minutes, or until skin begins to split, then drop in ice water and let cool slightly. Skin should be easy to remove. Combine the tomatoes, spices, sugar, pepper flakes, and lemon juice in a saucepan. Bring to a simmer over medium heat and reduce heat to low. Cook, uncovered, until very thick, about 1 1/2 hours. Stir occasionally to check for thickening and to prevent scorching. Makes about 2 to 2 1/2 cups. Heat oven to 400° F and place squash and apple in a roasting pan. Bake for 40-60 minutes until soft. In a large pot heat the oil until hot, add the onions and garlic and saute until translucent. Add the squash and saute for another 30 seconds. Add ½ to 1 cup broth and puree with a hand blender (a blender or food processor works too). Then add the remaining broth and soy cream, salt, nutmeg and cinnamon and stir. Simmer until desired consistency is reached. Pour into 2 greased and floured 5×9 bread pans. Bake for 1 hour, until a toothpick comes out clean. For muffins, bake 1/2 hour. For fans of fried things. Mix all ingredients together, except for the oil, and let rest about 10 minutes. While it is resting, heat the oil over medium heat. Shape mixture into patties and fry, one at a time, for about 4 minutes on each side. Drain on paper towels and serve with your favorite sauce. Make with your favorite fruit. Peel the apples, then core and thinly slice them. Toss with 1/2 cup sugar, 1 tablespoon flour, and cinnamon. Spread evenly in a 9″ x 13″ baking dish. 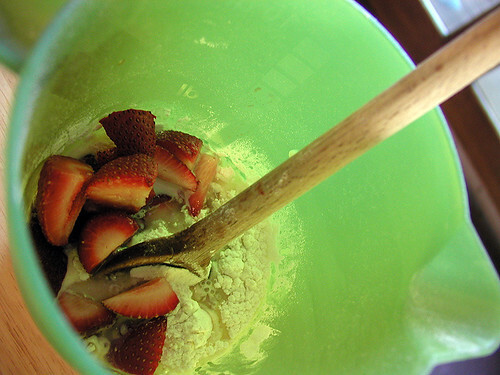 Mix the rolled oats with the remaining flour and sugar. Add the margarine and work the mixture until it is uniformly crumbly. 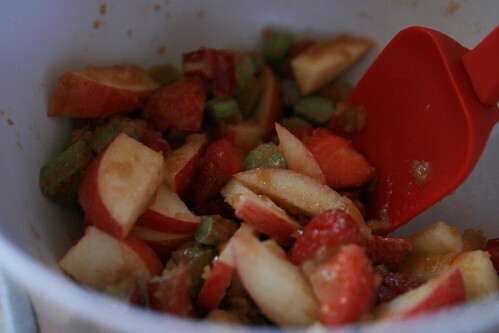 Sprinkle evenly over the fruit. Bake for 45 minutes, until lightly browned. Let stand 10 minutes before serving. My son is particularly fond of it served warm, with some Soyatoo whipped cream on top. This is adapted from someone else’s Tofu Pot Pie recipe. I prefer it with seitan, so it’s more like the comfort food I grew up with. Make it in a regular-sized pie plate or casserole dish, or, for fun, make individual pot pies in a muffin pan. Preheat oven to 350F. Dice and fry one package of chicken style seitan. I lightly fry it in canola oil, turmeric, paprika, coriander, and a bit of chili powder. When the onions are soft, add the other stuff. Heat and stir until it’s boiling and thickened. 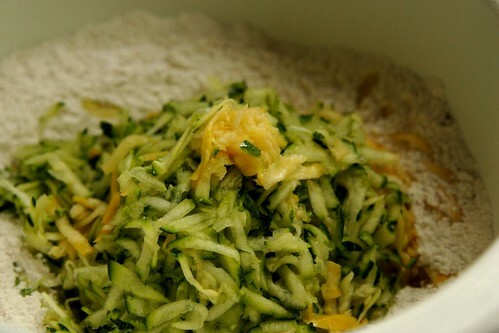 Mix it with the filling and dump into the crust that you prepared (you….did prepare the crust, right?) then cover it with yet more crust, make some holes in the top with a knife or fork or something, and bake for 30-40 minutes or so. In 2008 I got half a share in a CSA for the first time ever, and I’m glad I did. It forced me to try all sorts of produce I never would’ve gotten around to otherwise. 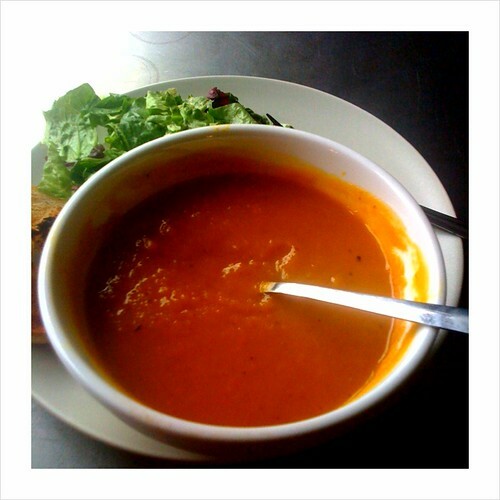 And because of that, this soup recipe is one of my new favorites. Put the oil in a large, deep saucepan over medium heat. When the oil is hot, add the vegetables. Sprinkle with salt and pepper and cook, stirring, for 2 or 3 minutes. Variations: Add shredded cabbage or diced carrots for some more color and texture. For more flavor add some garlic or onions when you add the vegetables. If you like your soup a little creamier try adding some plain soy creamer (Silk, Wildwood or Soyatoo). Or try pureeing half, or all of the soup in a blender. Today marked the first snow of the season. Even though the sad dusting was sort of fake-looking and mostly melted right away, I think it still makes it the perfect time to bust out this hearty (read: carb-laden) stew. And the recipe looks more complicated than it really is, I swear. Open and drain seitan package, tearing chunks into bite-sized pieces as needed. Dice onion and garlic to your liking. Heat large sized kettle/pot with a couple tablespoons of canola oil. 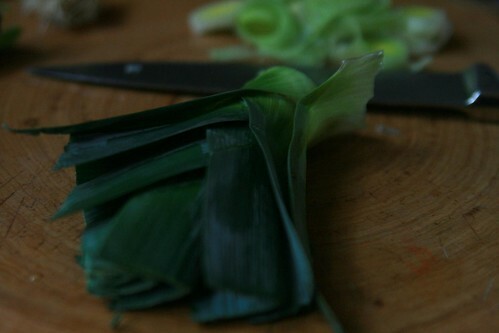 Saute onion and garlic until fairly translucent, but not burnt. Add seitan to pan and stir in. Season with 2-3 tsp mustard powder, 1 tsp paprika, 1 tsp turmeric, some salt & pepper and stir until seitan and onions are evenly coated. After the seitan and onions seem fairly coated with seasoning add 8 cups of water, 3 Tbsp of worcestershire sauce, and 1 tsp of sugar. Put lid on pot and bring to a boil. Once boiling, add potatoes and carrots. Replace lid and simmer on medium-high for 30-35 minutes, but set timer for about 20 minutes. At that point add the frozen corn and/or peas and stir. Then get your dumpling batter ready. Mix until batter is wettened, but don’t overstir. When the stew’s 30-35 minutes are up remove lid and poke potatoes and carrots with fork to make sure they are well cooked. If they are go ahead and drop the dumpling batter in by spoonfuls. Replace the lid and steam for 15 more minutes. Check that the dumplings have expanded and look appropriately puffy before turning the burner off et voila, soup’s on! Recipe originally taken from an old zine called Bark&Grass (only two issues were put out). Mix all ingredients, ‘cept for the tofu, together. 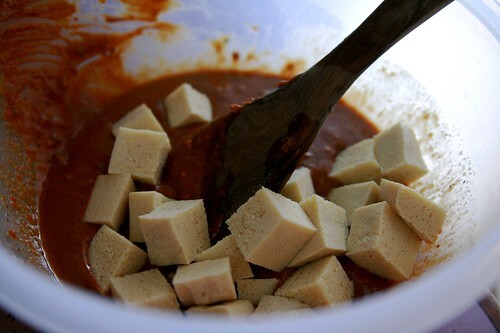 Squeeze the water out of the tofu, cube it and cover it in mixture. Let sit for about an hour. Lightly oil baking pan/casserole dish. 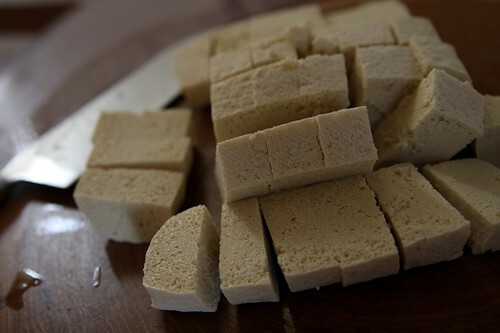 Dump tofu in and spread it around as evenly and thinly as possible. Take tofu out, turn it over, and bake for another 30 minutes. Take tofu out and pour one bottle of Annie’s BBQ sauce over tofu. Bake for another 10-15 minutes. Serve with rice, corn bread, corn on the cob, or whatever strikes your fancy. This is a recipe that’s been around in my family for a long time, and it even found its way into a cookbook many years ago, contributed by an aunt of mine. 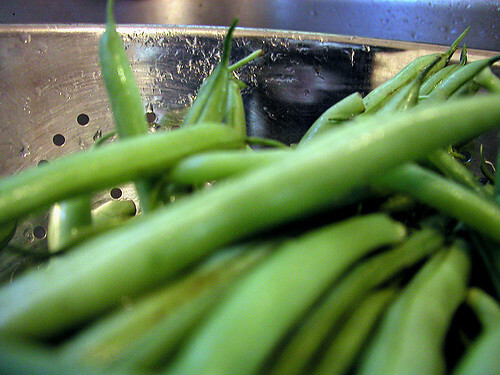 Wash the string beans. Snip off the ends and break the beans in half. Allow to dry thoroughly on a clean cloth or paper towel. Chop the onion. Peel the potatoes and cut into quarters. In a heavy dutch-oven type kettle, place a small amount of oil. Add the string beans and onions. Stir fry for 5 minutes, turning often. After 5 minutes, add the potatoes. Continue cooking the string beans, onions and potatoes — stirring often. While they are frying, add salt, pepper, sugar, red pepper, and ground cumin. Add the tomato sauce to the Lubeeyah after it has cooked for 25 minutes. Stir well. 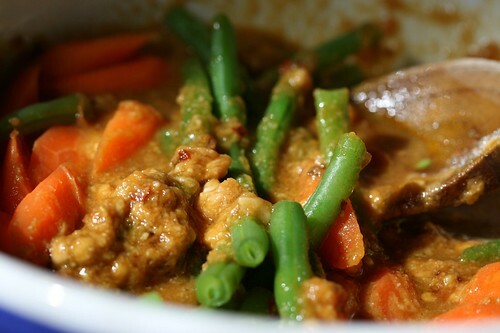 Cover and allow the stew to simmer for another 15 minutes, or until the vegetables are tender. Remove from heat and either serve immediately or refrigerate overnight and use as a cold salad. Oh how I love the weekends. We usually make pancakes at least once. A friend claims that there are no good recipes on the internet, but I think he had a few too many bad experiences in the early days. This recipe is one I originally found on VegWeb, but then modified until it went from ok, to something that I love and has been a big hit at many a potluck. Start making some rice. Or noodles. Whichever you prefer. Combine the first set of ingredients to make the sauce. Spice to taste. Steam veggies until they can be poked with a fork. Mushy vegetables are bad. Broccoli should be bright green. Toss the veggies, tofu, and sauce in a bowl while the veggies are still hot. Serve over rice and/or noodles. My ex’s specialty, and his recipe. Mix the sugar and cinnamon together in a small bowl and set aside. Mix the shortening, sugar, egg replacer, and water. Add the flour, cream of tartar, baking soda, and salt. Shape into balls, roll in the sugar and cinnamon mixture, and flatten a bit.